Founded by educators in 1934, STCU is a not-for-profit financial cooperative that is committed to the financial health of our member-owners. Consistently voted the region's favorite credit union, STCU is dedicated to the communities we serve. Visit us at stcu.org/workshops to learn about our free financial education workshops for adults. You'll find information about financial education events for students by visiting our blogs at stcuteens.org or stcukids.org. 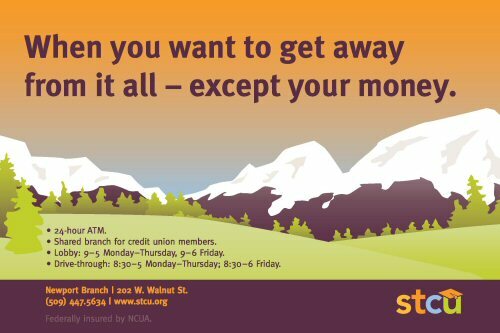 STCU has branch locations throughout Eastern Washington and North Idaho. Members can also access their accounts through STCU online banking, the STCU mobile app, and through thousands of surcharge-free ATMs and the nationwide shared branching network. Learn more at stcu.org, give us a call at (800) 858-3750, or visit our branch in Newport, where we've been serving the community since 1989.